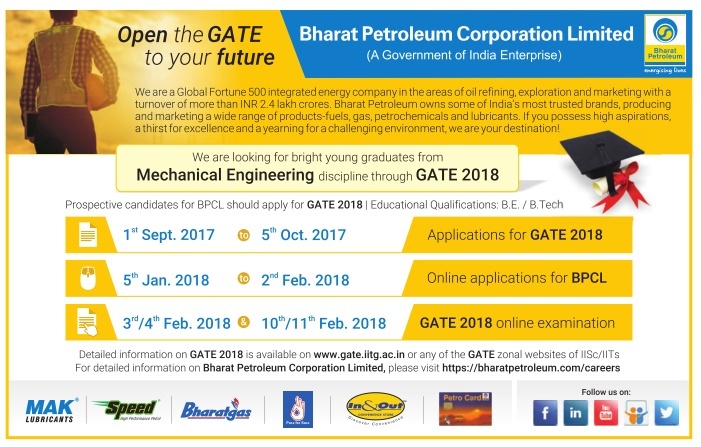 BPCL Recruitment 2017 for the post of Management Trainee from eligible Graduate Engineers(Mechanical Engineering).All eligible candidates can apply for this positions in online. Candidates with Integrated Courses or courses with 5 year or more course duration would not be eligible to apply for the position. The courses offered by Autonomous Institutions should be equivalent to the relevant courses approved /recognized by Association of Indian Universities (AIU)/UGC/AICTECandidates in the final year of their engineering studies may also apply. How to apply BPCL Recruitment 2017? All interested and eligible candidates apply for this position in onlinethrough GATE 2018 latest by 5 October 2017.